My daughter, Josephine, is 3 years old. She is loving, sweet, demanding, needy, and the light of my life along with her older neurotypical siblings who are 16, 18, and 21. She was diagnosed with CDKL5 right at her third birthday, which was less than 3 months ago. Our CDKL5 case seems to be very different from anyone else I’ve met in that my daughter has 2 rare conditions and one additional condition that isn’t all that rare. She was diagnosed via genetic testing at 3 weeks old with Congenital Myotonic Muscular Dystrophy, also known as DM1. I, her mother, was diagnosed with a much milder version at that time. She seemed to have a pretty typical case of congenital DM1 initially. She needed intubated at birth, had extremely low tone, and was very floppy. They weren’t sure she would survive her first 48 hours and was hooked up to so much medical equipment, I couldn’t hold her for days. When I finally could, it took 3 nurses to place her and everything she needed in my arms. She became more stable and sturdier and was put on a nasal cannula instead of intubation after a surgery to bring her chin forward and open her airway. She had a couple of other surgeries while in the NICU for g-tube placement and other airway issues. She coded twice. Both times I was with her, and I was sure I was going to lose her before she ever even got a chance to be outside the hospital doors. She had her first seizure while still in the NICU at a little more than 3 months old. She made some odd repetitive movements with her arms. I brought it to the attention of her nurse who realized what was happening and reported it to her medical team. An EEG was ordered and Keppra was started. As she got older and I connected online with other parents of children with her condition, I started to realize that while she had a lot of similar issues to their kids, she had additional issues too. She remained floppy while other kids with congenital DM1 improve in the first months/years of their life. The seizures where not standard either. Then she was diagnosed with CVI. The thing that bothered me most besides her total lack of head control, was she never used her hands in a coordinated way. She had a couple of difficult to interpret signs and would not grasp a toy on her own. She would only very briefly hold onto something if you placed it in her hand and helped her grip it first. The other kids I saw online were meaningfully and purposely playing with toys and using their hands. I thought at first that the CVI might explain some of her additional issues, but in time, it still didn’t make sense. Then she had an MRI that indicated her brain gray matter had not formed properly. She had some clusters of gray matter. This is known as Gray Matter Heterotopia (GMH). It isn’t considered a rare condition though I hadn’t previously heard of it. Some people with it live a normal life and present as neurotypical. Some are disabled. Many have seizures later in life. It was not connected to her DM1 diagnosis. I thought I finally had my answer to her other issues. I was ready to accept this, but we already had a genetics appointment coming up, because I had been nagging anyone on her medical team that would listen about her other issues that couldn’t be explained by DM1. At that appointment, they decided to run an Epilepsy panel. I had spent so much time trying to get answers that although I thought we had found one, I let them run the test. They had already drawn blood to do so at a previous appointment, and our insurance was covering it. Several weeks later, I got a call telling me they had found something. When they decided to test, they had promised to tell me on the phone, not keep me waiting for a follow up appointment, and they kept that promise. I spent a lot of time researching CDKL5 after that phone call while waiting for the next genetics appointment. Unfortunately, the appointment was useless as the medical professional was using the same resource I had already used to learn more. She was Googling and finding the same info I had already found. We did have a more informative appointment over 2 months after I received her CDKL5 diagnosis with another geneticists. 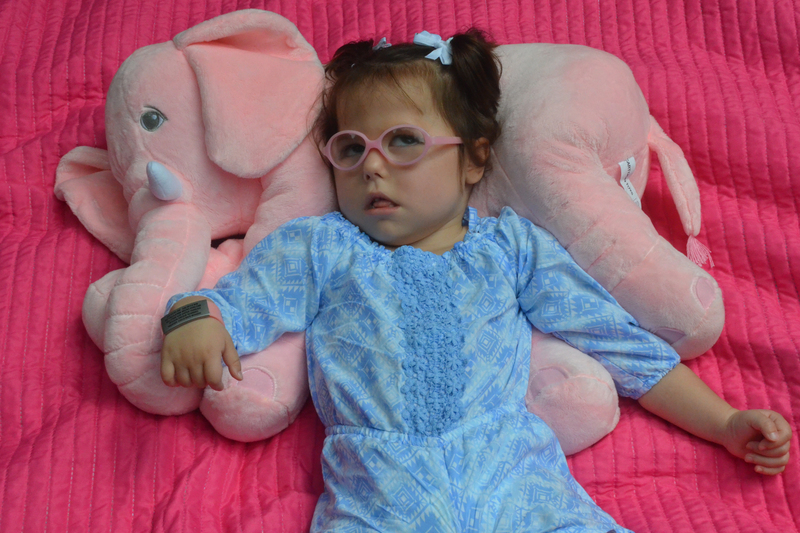 So, as you continue to read her story, you need to keep in mind that she has 2 rare conditions. Some of the symptoms are from one, some are from the other, and some symptoms overlap. Sometimes I am not sure which issues should be attributed to which condition, and sometimes I do know. Controlling her seizures has been a struggle since they began. We upped doses and added meds. At one time, she was on 5 meds and sleeping 22 hours a day and groggy the 2 nonconsecutive hours she was awake and was still having seizures. Currently, she is on 3 meds and the ketogenic diet. I feel like her seizures are mostly controlled. She went from 3-12 seizures a day to 1-2 a week. They are very mild, mostly some brief low amplitude jerking in her hands and arms. Two weeks ago, under her neurologist’s care, we started weaning meds. My goal is to wean as much as possible, begin CBD, and then hopefully wean more or all meds. I feel like the meds are slowing her down physically and cognitively. She will always be cognitively and physically impaired, but I want to get her off as much of the meds as possible to see to what degree. Before we started all of the dose increases and additional meds, she was demonstrating better coordination and cognitive ability. I am told the seizures aren’t damaging, so I can only assume it is the meds. The med we first started to wean first is Keppra. She is also still on Trileptal and Onfi. At one time, she was also on Topamax and Vimpat. Due to timing, I am certain it was the Topamax that led to the increased and excessive sleepiness. Neither the Topamax or Vimpat affected the frequency of seizures and we weaned those leading to more alertness. My daughter is exclusively g-tube fed. Her g-tube was placed at 4 months old about a week before she was finally released from the NICU. At one time, she was allowed tastes, but has since failed a swallow study and takes nothing via mouth. It was upsetting at first, but we now have a great routine. I feed her a blended diet that I prep once a month and freeze. G-tube feeding has made following the keto diet so much easier. She does sometimes have issues with constipation regardless of what she is being fed. She was diagnosed with CVI about a year and a half ago. She was placed at a 1 on the scale. This was at the time when she was sleeping the day away, so it was difficult to get her to participate in the evaluations. A few months ago, she had another evaluation and was placed at 4.5 on the scale. I can definitely see the improvements. She looks at familiar faces and toys and has started turning to look at sounds. She also seems to be able to see pages in books that are very familiar and simple. Every 6 months, she goes to an all-day appointment at her neuromuscular clinic for her Congenital Myotonic Muscular Dystrophy. All of her specialists see us in one room. One of these is a cardiologist due to heart concerns from DM1. She does have a slightly elongated QT rhythm, but it is still in the normal range. I found out that CDKL5 also had heart concerns, but the monitoring she already required covered the monitoring she would need for CDKL5. She also sees 2 neurologists, ortho, plastic surgery, genetics, pulmonary, endocrine, rehab specialists, dermatology, ENT, and probably others I am forgetting. She is on oxygen via nasal cannula at night when she sleeps and a pulse ox. She will soon have a sleep study to evaluate her for a C-Pap. She does fine respiratory-wise during the day as long as she is not ill. When she has an illness, she sometimes needs oxygen during the day too. It does take her a lot longer to get better when sick than a typical child. She still has little to no head control. She doesn’t lift her head off the floor when on her belly. If I am fully supporting her, she can look left and right. She has no fine motor skills. She still doesn’t play with toys other than to bat at familiar objects suspended in front of her. She knows 4-5 signs (hi, bye, more, all done, love you). She will only do them on rare occasions. We are working on communication via switch using a program called two step partner assisted scanning. We have a binder of choices that I can read to her and she can hit a switch by her head for no and one by her hand for yes. She is willing and able to do this, sometimes better than others. Our goal is to work up to using a communication device instead of a partner and binder. We have had some severe sleep issues. Recently, she was sleeping a lot during the day and awake frequently at night. She wasn’t upset at night, just noisy, and she sleeps in her bed next to my bed. I couldn’t keep her awake during the day, she just slept through everything including showers and therapy. I hated to add another med, but she was sleeping her life away, sometimes from 10 PM one night to 6 PM the following day waking up in the middle of the night around 2-3 AM for an hour or so and again around 4 AM. She was put on a very low dose of Ritalin two months ago for this issue. Her pulmonary specialists stated that he usually waited until his DM1 patients were 5 before starting this, but in this instance, it was warranted sooner. Within 24 hours, she was on a much better schedule. She sleeps 12 hours at night and is awake and alert for 12 hours during the day. She is currently in OT, PT, Speech, and Vision therapies. She takes sessions of aquatic therapy also. She has done individual music therapy in the past but outgrew that program at 3. They have a program for ages 5 and above in a group setting, and we look forward to joining in again then. I have found the therapies helpful. They give me lots of ways to work with her at home too. She started preschool recently at our public school. They have a great set up and are well known for serving IEP kids. The teacher is certified in special needs and the class sizes are a max of 16 kids, usually less, with half having IEPs and half typical. Josephine has her own aid. I was hesitant to send her to school due to concerns about taking care of her medically, but they have done a terrific job after allowing me to come in and show them her needs. She goes 3 days a week in the afternoons. They took my daily list of therapeutic activities that I did with her at home and completely took those activities over at school. I get to be just mom, not therapist on those 3 days, and I love it. One other day a week, she goes to a local therapy center with 3 other kids. Parents attend also. She gets OT, PT, and Speech there. We have lots of medical and therapy equipment to help us care for her. Our house looks like a therapy center. She has an Infinity feeding pump, custom AFOs, sensory room, stander, Special Tomato seat, Tumbleform seat, a Zippy Iris wheelchair, Convaid Cruiser medical stroller, padded floor mats, i-Pad, therapy wedge, saucer swing, Firefly Splashy, Firefly Go-To seat, a bath seat with legs, cough assist, suction machine, pulse ox, travel pulse ox, oxygen concentrator, safety bed, switch adapted toys, various trays and tables to put things at the correct height in her stand/sit equipment, and a gate trainer that she isn’t really ready for. I use a few different soft structured baby carriers to haul her around when the terrain or our mood isn’t suitable for wheels. Some of these items insurance covered, some I bought new or used, and some were kindly donated to me from other parents in different Facebook groups. We are modifying our van early next year. Our home is a quad with four floors, and I don’t know how much longer I can haul her up and down between the 3 floors she is frequently on. We’d like to move to a more suitable home, but the timing isn’t right for other reasons. Josephine mostly enjoys sitting with me. She doesn’t laugh out loud almost ever, but she will light up sometimes while I talk to her. She lets us know what she wants and doesn’t want with her moods and behaviors. She seems happy enough to go to school and the therapy center. We read and do various therapy activities that I try to make fun for her. We play little games swatting a ball back and forth on her stander tray, signing ‘love you,” and tickling her feet or toes. It makes my day when she manages to respond to me, because it is so difficult for her to coordinate her movements to do so. I know there is more to her cognitively than most people can see, but it is difficult for her to show that due to her physical limitations. I make sure everyone knows and understands this about her so that they interact with her accordingly. I hope desperately for a cure for both conditions. I would obviously be thrilled with a cure for either condition though. I wonder what that would mean for her. What would she be like if she only had DM1 or if she only had CDKL5? Regardless, I love her just the way she is, but I can’t help wanting everything for her that most other kids have.